Shown above is a line of any length with a point P positioned on it. If the point is positioned at the end of the line of very close to the end, extend the line and the same principles will allow you to complete the question. Line AP and BP are congruent because they were both drawn with the same compass width. Line AC and BC are congruent because they were both drawn with the same compass width. Triangles ∆APC and ∆BPC are congruent becasue they have three sides congruent. Line CP is common to both triangles. 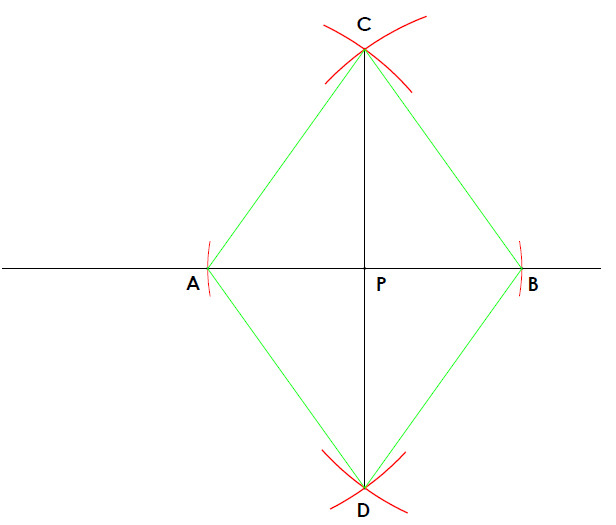 Angles APC and BPC are congruent because the matching angles of congruent triangles are congruent.